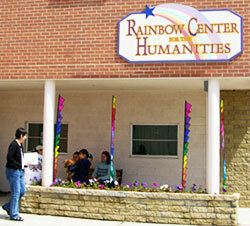 The Rainbow Center for the Humanities has been created under the direction of the Master St. Germain to bring together people from all walks of life, backgrounds and belief systems. We invite the young and the mature, men and women, local and global to join us in our activities–classes, workshops, channelings and gatherings. “To offer light to all of those who are awakening from darkness. 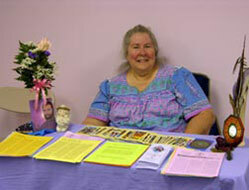 We invite healers, teachers and seekers of new vision, to bring their ideas, modalities and questions to share. Our desire is to seek understanding and growth. We encourage people to make educated choices. 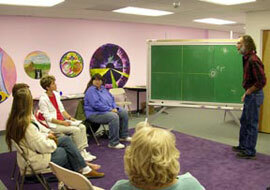 The center is available for workshops and gatherings. On the wall behind this group are a few of the paintings contributed to the “Wall of Unlimited Possibilities”. Our Kwan Yin statue was purchased in Reno, NV. She is solid serpentine and weights about 145 lbs. The Painting and poem to her left were inspired by Kwan Yin and came to us from artist Dawn Flores in Richmond, VA.